It is said that the electric field is mediated by virtual photons. It is told too that the gravitational field is mediated by virtual gravitons. The gravitational field is a warping and streaming of spacetime itself, dragging along everything that is in it. There are no gravitons sent out by masses, travelling through space and hitting another mass, in doing so causing gravitational attraction. There are things like that called gravitational waves, but that is not ordinary gravitation. The inverse square force law of gravitational strength originates from principles in GR (General Relativity) that are very different from those in the electric field of a point charge, despite its formula resemblance. But the electric field indeed does work like that. At the start a real photon conveys a backwards directed impulse to its origin opposite to its own (third Newton law, action plus reaction equals zero). At the start it conveys too a small amount of rotation to its origin opposite to the photon’s spin +1 or -1 (third Newton law again). The spin has been given to the photon by its origin as a condition for existence. It travels through space carrying the energy associated with its impulse (E=cp). Then it hits a goal and becomes absorbed, transferring its impulse, energy and spin to the goal. Virtual photons are said not to transfer measurable amounts of impulse or energy. Instead they cause electric repulsion and attraction as effect - let’s take attraction as example - in a mechanism that is not fully depicted yet. They alter the energy distribution when attraction or repulsion becomes apparent; by example potential energy is transferred to kinetic energy, or the other way around. Suppose an electric charge has just released a virtual photon. As viewed from the outside the photon then splits into an innumerable amount of virtual photons, every photon going in one another direction. Observed from the outside the virtual photon exists in a superposition of all its possible states. Here that is an interference pattern of photons, covering a sphere’s surface. A sphere-surface of photons each living in another world. I assume the number of virtual photons to be infinite at the start. This would be fermion behaviour if it would happen in one world, because no two photons travel in the same direction. Photons tend to get in the same state, especially when close to each other and especially when there are already more photons present in the same state (boson behaviour as source of laser effect). But here every photon lives in another world and they don’t see each other. Every photon has a reality-experience of its own and it experiences itself as being the one and only photon sent out by the charge in one specific direction. Then the virtual photon reaches a charge. It couples with it and a small attraction is caused. When you measure the attraction, you have entered the world in which the photon travelled the right direction to meet with the other charge. I assume the right direction and the directly neighbouring directions: the target charge (electrons, protons and so on) is supposed to have a diameter. You do not see the interference pattern no more. In the world you have entered it isn’t there no more. That is, in one world it does. When you have not measured the attraction, you may conclude you have entered the world in which the photon travelled any direction but the one to the target charge. In this other worlds it just goes on, still on the search for a charge to couple with. That’s in agreement with the Coulomb law stating a charge can simultaneously be in electric interaction with as many other charges as you like. No, you can’t get rid of all those goal-missing virtual photons. Other charges far outside are waiting for them. You experience the effects of the residual interference pattern which is the original interference pattern with a hole in it on the place where it had passed the target charge. The diameter of the hole is the diameter of the receiving charge. I inferred the possibility of holes in an interference pattern from Experiment 3, “The hemisphere shield”, see next page of this storyline. Whatever world you might have entered, soon thereafter (a couple of hours) decoherence provides the rest of the solarsystem with all its other observers, has entered the same world. As the interference pattern travels along with the speed of light, it expands with the surface of the sphere it covers, offering ever more places where the virtual photon can be. The interference pattern meets other charges. Every time that happens the world splits into two worlds with one you in each of them. In one world you measure an attraction or repulsion. In the other world another hole appears in the interference pattern. Does a hole grow with the expansion? I don’t think so since it represents one specific direction that is wiped out from the interference pattern. It is not a physical object causing a shade. Maybe at the expanded surface the wiped-out direction is projected and at that place the hole with its specific diameter is placed on it. It sounds strange that an other world comes to existence just because of one virtual photon entering those two worlds. It seems to be more convenient those other worlds already exist. Just like in SR (Special Relativity). In SR the worlds of the past are still existing and are still happening and the worlds of the future are already existing and are already happening. Somehow the worlds of the superposition must be there already too. Forever, as to speak. But where the past and future worlds in SR are still/already happening somewhere else along the fourth dimension, the worlds of the superposition in quantum mechanics are happening at the same time and occupying the same space. If the splitting of a state in a superposition of states - such as a virtual photon just emitted by a charge - is an event then SR provides this event to be forever and to happen forever (“Forever” as observed from an observer that moves with sufficiently high velocity with respect to the events in consideration). So at least there must be some kind of branching of realities existing. A branching that has laid its path through an already existing possibilities-universe. A real Sea of Possibilities. There is one branching in which every subsequent virtual photon sent out by our starting charge, always hits that one and the same nearest charge. There also must be one branching in which none of the charges in our observable universe has ever been hit, the remaining interference pattern of virtual photons still travelling past all the matter we can observe. The interference pattern then is so much expanded it engulfs the entire observable universe and it has a hole in it for every particle it has ever passed and with which it could have coupled with. This looks like an Everett universe, named after Hugh Everett. In Everett’s there is an absolute branching of the whole universe for every state transition. In mine’s not the whole universe branches immediately. When a small part of the universe is in a superposition of states, initially only thàt part branches in as many branches as there are states. When that part becomes observed then, only the observer splits and enters each of the superposed worlds where a measurement became apparent. Usually this situation endures very short. Soon decoherence makes the environment of the observer to split too and enter the same worlds, including all other observers. Decoherence usually ensure the environment branching along with an observer. But at page Environment-induced decoherence in the storyline THE COLLAPSE OF THE WAVEFUNCTION we stressed decoherence isn’t a fundamental feature of spacetime and can in principle be made small enough to establish the existence of superposed worlds. In the previous page, EXPERIMENT 1, is shown that distant correlated particles, when observed, do not exchange information. Therefore there is no reason anymore to assume infinite fast transfer of information. We assume again the speed of light is the absolute upper limit of every kind of displacement. Especially holds that branching cannot spread faster than c.
The speed of branching of localities might equal the speed of the propagation of the shell after shell sagging-in process of gravitation (storyline NEWTON EINSTEIN KIEKENS GRAVITATION, page 5, paragraph Propagation Speed). Which on its turn might equal the speed of light. In Everett’s the branches are spatially placed next to each other in the direction of an other dimension. In mine’s the states in superposition are at the same time and do occupy the same space. They permeate each other (without seeing each other), necessary for an interference pattern to arise for outside observers not yet touched by decoherence. It is difficult to grasp where we are now, in what branch in the possibilities-universe. At first there is some anthropic choice: we find ourselves back in a universe that sustains DNA. But next, it is the most convenient to assume we always are one of a majority of branches. It seems reasonable to speak of a chance of being in a certain kind of branch, a chance of being a certain kind of branch. This chance is low when there is only one of it, or only a few of this kind. This chance grows when there are more of them, a lot of them, with a like appearance. For convenience we abbreviate “the chance of being in a branch where (statement)” to “the chance of (statement)”. Then our starting charge sends out a second virtual photon. One photon hit doesn’t make summer yet. You need quite a number of hits for measuring the first signs of the attraction. The chance of the second sent-out virtual photon to be directed precisely enough to the same receiving charge equals the surface of the sphere of photons divided by that part of it that is occupied by the receiving charge, its cross-section. The chance of a virtual photon to hit a charge at a certain distance r is inversely proportional to the surface of the sphere at that distance. So an inverse square law appears. We always find us back in a branch. By example in the branch where the first virtual photon did hit our receiving charge, then the next four million emitted virtual photons miss it, on its way as they are to other charges. Then the next hit occurs, then maybe three million photons missed before the third hit. And so on. We have like chance to be in either branch of this kind. The picture arises the chance for the next hit to be on our receiving charge is the inverse of the number of worlds it could have been elsewhere otherwise. The number of virtual photon hits per second on the receiving charge is inversely proportional to the number of all places where the photon can be at that distance. And this is completely different from the mechanism that yields the inverse square decreasing of real photons, see picture above at the right. There the intensity of the band of light is proportional to the real photon density. It is tempting to propose the strength of the electric interaction being proportional to the virtual photon density. But it is quite something else. The strength of the interaction is inversely proportional to the remaining number of worlds in interference. There is one more peculiarity to view. When the emitting charge initially has spin +1/2 the emitted photon then has spin +1, after emission leaving the charge with spin -1/2. If no absorptions from the outside disturb the situation in between, the next emitted photon then can only be spin -1, leaving the charge with spin +1/2 again. And so on. As observed from the outside the photon is a superposition of an infinite number of equal photons emitted in all possible directions. They do not see each other but appear to the outside as the surface of a sphere that can be penetrated by holes. So there are two versions of subsequent emitted virtual photons by one charge. One version is a series of alternations of spin +1 and spin -1 beginning with spin +1. The second version is precisely the same series, but the alternation begin with spin -1. If the spin of the emitting charge is unknown, these two versions are in superposition. This doubles the number of possible worlds, which is now twice the surface of the sphere divided by the cross-section of the receiving charge. Since we are dealing with wavefunctions there has to be squared to obtain the probability division. So the strength of the electric force of the charge is divided by four. We have now a charge sending subsequent virtual photons. Each of the virtual photons is covered by two sphere-surfaces, one consisting of spin +1 photons and the other one consisting of spin -1 photons. Those photon-sphere-surfaces are precisely coinciding but they do not see each other. From the outside the photon spheres are in superposition and the interference pattern looks like a spin 0 photon-shield, a sphere of scalar photons. How is it on a receiving charge? We assume the receiving charge to have spin +1/2 or spin -1/2. That holds for leptons and hadrons. Spin +1/2 can absorb a spin -1 photon; spin -1/2 can absorb a spin +1 photon. But a spin +1 photon will pass by a spin +1/2 charge and a spin -1 photon will pass by a spin -1/2 charge. If the spin of the receiving charge is unknown, it will be in a superposition of spin +1/2 and -1/2. When the pair of photonsurfaces arrives at the receiving charge it splits in three: at the location of the receiving charge one pair of spin +1 and -1 photons enters the world in which the receiving charge has spin +1/2; one pair enters the world of the receiving charge having spin -1/2; and the third world consists of the remaining interference pattern that now has a hole in it at the location of the receiving charge. Then in the first two worlds the appropriate photon is absorbed and the other one passes by. The latter ones, being the result of a previous splitting and now forming a new pair, are in a superposition of spin +1 and -1. Just as before arriving. It fills in the hole perfectly. So what happened? As observed from the outside this looks like a superposition of two states: one photon that has passed by a charge. Or it had been absorbed by the charge and emitted again immediately thereafter. Neither is the case. Despite their denotation as “virtual”, the two absorbed photons and the charges that absorbed them, have a reality-experience of their own. In that reality we assume they obey the same laws of physics as we do, here outside. Therefore the two photons must have conveyed their energy, impulse and spin to the receiving charge in their respective worlds. And there were no emissions. As viewed from the outside the photon superposition just before entering the receiving charge is precisely the photon superposition after passing it. Without any holes in it. So there obviously has been no net transmission of anything at all. Still there has happened something - but what? The number of possible worlds has changed, hasn’t it? The photon that passed by, in passing by the number of worlds had changed - it was not only just passing by! From the outside, for the photon to earn its denotation as “virtual”, all superpositions remain intact. But when an effect does occur, like a first bit of attraction becoming apparent, this holds as an observation causing the world to split in its possible outcomes. In the famous two-slit experiment of electrons sent one-by-one through the slits, the electron splits at the start of its paths but merges again at the end of their paths, because the end-states are indistinguishable. Something like that happens here too. one charge in a superposition of spin +1/2 and spin -1/2. The photon passes by. The end-states of the upper-left and the lower-right picture in the scheme have merged to one world. This state is precisely the starting state and is assumed to have had no effect on the charge. one charge in a superposition of spin +1/2 and spin -1/2. The photon is absorbed. The end-states of the lower-left and the upper-right picture in the scheme have merged to one world. This state is supposed to cause an observable attraction when the receiving and emitting charge have opposite charge sign. This state is supposed to cause an observable repulsion when the receiving and emitting charge have like charge sign. As observed from the outside the absorbed photon is a superposition of two photons who are spatially precisely coinciding and having precisely the same direction of propagation and precisely the same spatial orientation of spin. Therefore the spin-values of the two states cancel out precisely. As observed from the outside the absorbed photon has become some kind of a spin 0 particle. But when regarded in the superposed worlds themselves they act as normal spin 1 photons! Since the endstates are different we, the outside observers, entered one of those worlds. We have a like chance to be in either one, for the spin of the incoming photon has a like chance to be +1 or -1 and the spin of the receiving charge has a like chance to be +1/2 or -1/2. The photon has a like chance to pass by or to be absorbed. So the number of worlds we are in doubles. For a single virtual photon event, in half of those worlds we experience neither attraction nor repulsion. In the other half we experience attraction or repulsion. We do not need to square for the wavefunctions to yield a probability distribution. Since we are in those worlds our existence embodies already the chance-division. Therefore the final strength diminishes by another factor 2. 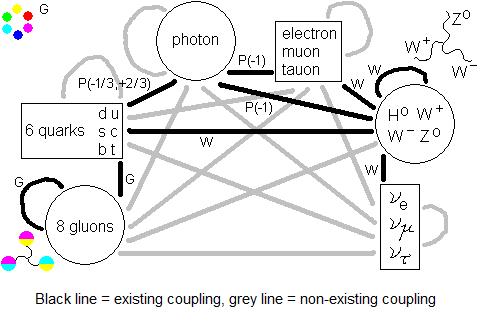 The total factor of decreasing strength of the virtual photon interaction is then 4 x 2 = 8. A row of clocks on earth all give equal time. When this row is observed from a fast moving rocket, the clocks run all different times. They are further ahead when farther away in the direction of motion of the rocket and are further behind when farther away in the opposite direction. When a rocket observer on his or her watch sees second after second elapsing, it sees on all the clocks on earth every different time given there simultaneously elapsing to their next moments of time.